Tatiana Ojeda, community leader and Erick Manzanares, and Róger Madrigal, Salinas de León, Nicaragua. EfD-CA Center research fellows Róger Madrigal and Eugenia León conducted the firsts field visits in Nicaragua in late March, as part of the AC3 Project “Water for human Consumption, Communities and Climate change: expected impacts and Adaptation in Central America”. During the field visits they were accompanied by Tatiana Ojeda who is a student in the Socioeconomics masters program at CATIE. This visit was the first fieldwork of the AC3 research project. The project’s main objective is to “Improve decision-making about investment in the design of plans and policies for adaptation to climate change of community organizations responsible for providing water for domestic consumption in Central America”. The countries at which research will be conducted are Guatemala, Nicaragua, and Costa Rica. 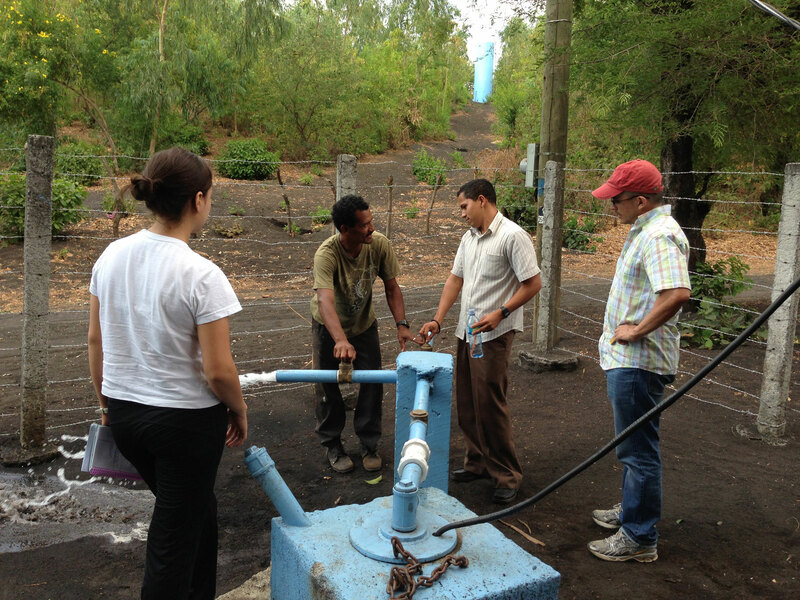 In this opportunity the research team visited rural communities located along the dry corridor near León, Nicaragua. For Eugenia this was “an amazing chance to see a glint of how rural communities deal with water provision, their economic conditions, and the role of community-based drinking water organizations (CBDWO)”. We had the chance to talk with 7 community leaders and members of CBDWO from “comarcas” such as Salinas Grandes and Lecheguajo” she added. The person in charge of completing this ambitious project is Róger Madrigal, “during this visits we found very interesting information which marks a great starting point for the next three years of exciting research”, he said. This project seeks to obtain primary data from a representative sample of CBDWO (in the selected countries) located in areas where major negative changes in the availability of water are expected due to climate change, in addition to other non-climatic disturbances. Research techniques include modeling of climate scenarios at local, regional and national level, qualitative and quantitative analysis of information on adaptation strategies of CBDWOs and economic. The AC3 is a collaborative research project between the EfD Research Program and the Climate Change and Watershed Program in CATIE and other partners. AC3 is financially supported by IDRC's Climate Change and Water program.